I checked a large item off my “to do” list today by finishing my boat’s transom and motor mount. 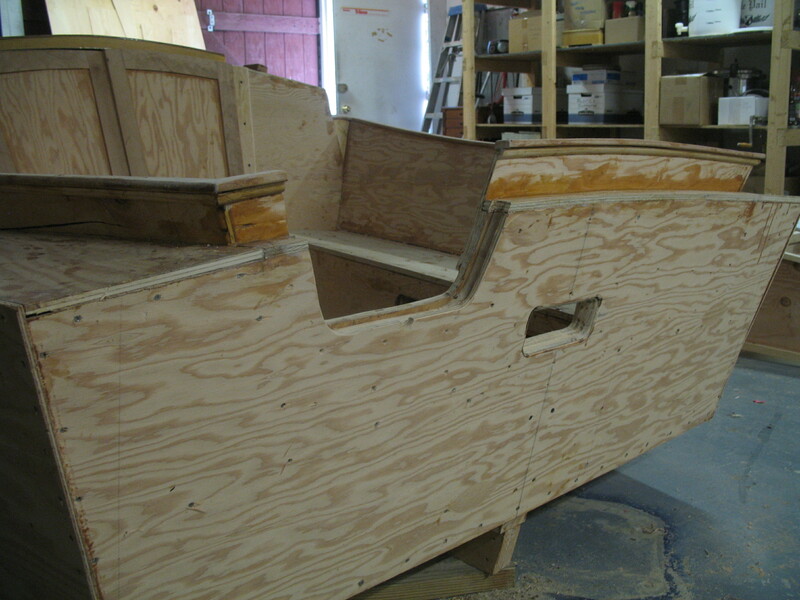 Over the past several weeks I incrementally built up the transom with multiple layers of pine boards and plywood—four layers in all—capable of supporting an outboard motor in a U-shaped cutout. A removable insert was also constructed, which fits like a glove and is very satisfying to slide in and take out. 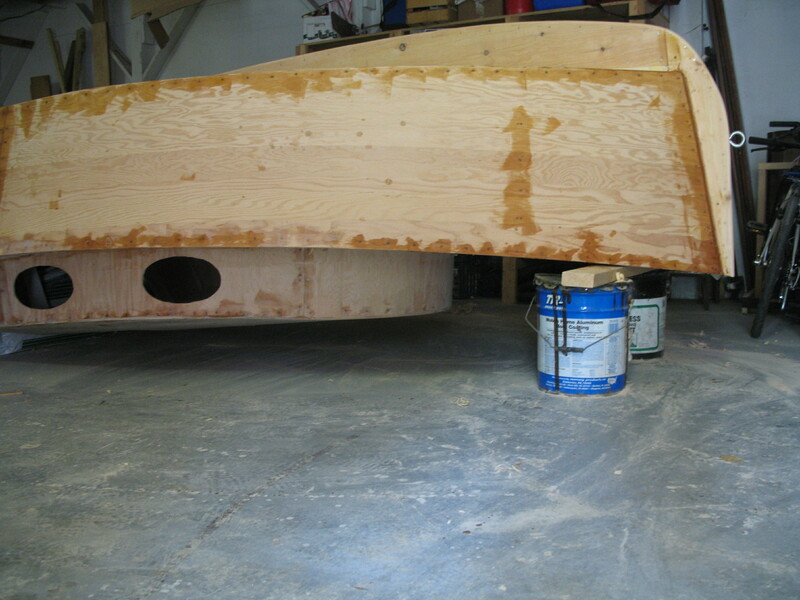 The completed transom, showing the cutout with the insert removed. 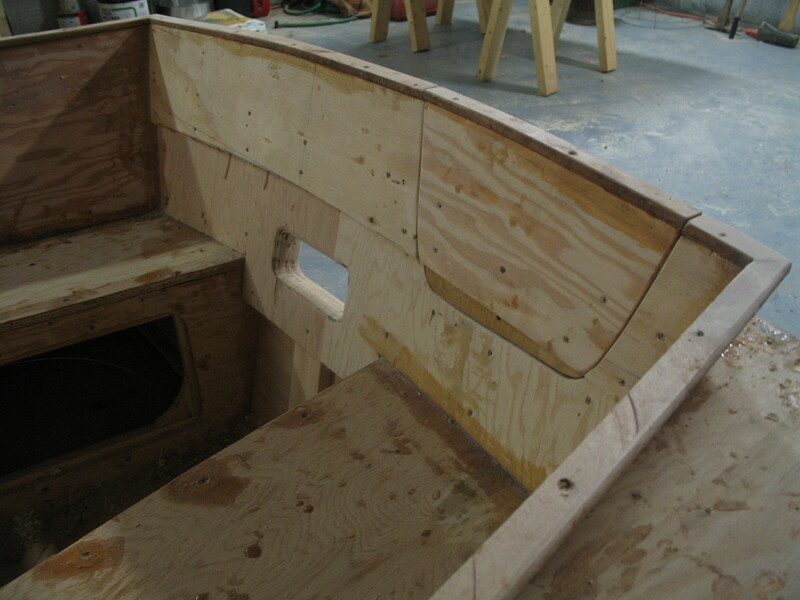 The transom, as seen from the inside. The insert is now in place. If I don't use an outboard, the boat will look like this most of the time. 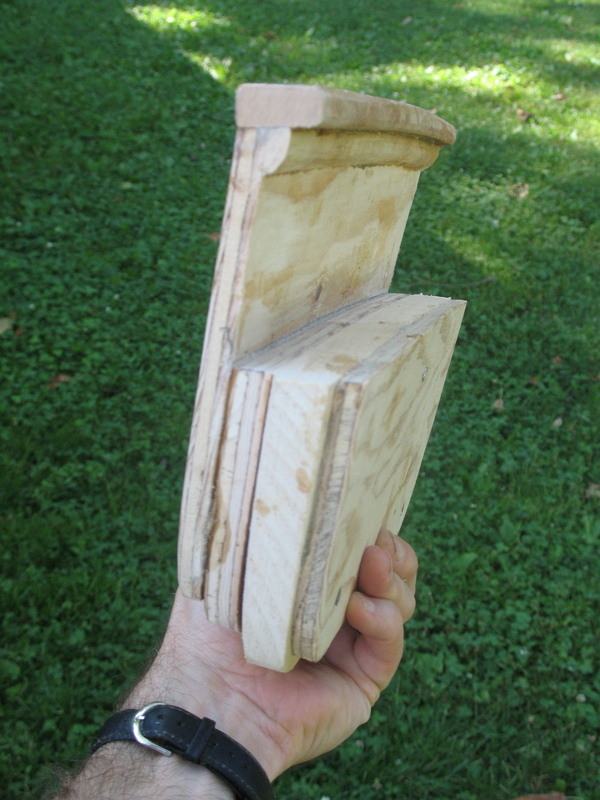 A sideview of the insert, showing all of the various layers used to build up the transom. I completed this step feeling conflicted. The truth is, I don’t like outboards. In my very limited experience, outboards are large machines that fill space and, as a general rule, refuse to start. On the rare occasion when they do cooperate, the result is a great deal of noise and nasty smells. But you have to have an outboard! people say. How will you get out of harbors? What happens when the wind dies? And they might be right. I don’t have enough experience to argue otherwise. My sailing experience is limited to Sunfish. But then again…Lots of sailboats, large and small, managed to get out of harbors and reach their destinations for millennia without power, so why do we think they are absolutely essential? Are they necessary, or simply convenient? Again, I don’t yet know the answer, but I have noticed a tendency in modern culture to forget what we can do without gasoline. To often, we accept the belief that technology that is available is technology that must be used. Twenty-five years ago a large branch broke off a tree in our front yard. We were newlyweds in a small California bungalow and my toolbox was small. As city dwellers, we had no need for a chainsaw. So I started cutting up the limb with my handsaw. A man walking down the street stopped to watch me work, then said, not in a friendly way, “Man, you are using entirely the wrong tool for the job!” and walked on. But why was it the wrong tool? I mused. It’s not morally wrong to use a handsaw. I wasn’t breaking any municipal laws. It was just a slower way of cutting wood. And why is that wrong? A more compelling case could be made that a noisy and potentially lethal chainsaw is the less responsible tool. I, on the other hand, was enjoying a sunny day and getting real exercise. One more story: For six years I completed most of my errands by driving ten miles round trip to our nearest town. For all those years, I wondered about running my errands on my bicycle instead. And for all those years, people gave me strange looks when I presented my idea. Why would you bicycle? was the immediate reaction. Aside from competitive cyclists in spandex and a handful of guys who look like they had one too many DWI convictions, no one rides a bike in my part of the country. We have roads; you have a car. Why are you talking about bikes? But one day I put on my helmet, pumped up the tires on my bike and headed out. It felt liberating to zip down the country lanes under my own power, without ever having to fill up at a gas station. So now I make the trip several times a week, weather permitting, whenever I need to pick up some books at the library, go to the bank, or swim laps at the YMCA. It takes three times longer to reach my destinations but in an odd way my sense of distance shrank. Five miles doesn’t seem so far on a bike. My town now feels closer. So in this contrarian frame of mind, I started looking at alternatives to outboard motors. If my goal is to have auxiliary power in tight spots or when I want to rush back to port, maybe a small battery-powered trawling motor would do the trick, I thought. And while I’m at it, why not add some solar panels so I can recharge my battery and travel carbon-free? It was an intriguing idea, but I know very little about solar power and I quickly got lost in the unfamiliar language of deep cycle batteries and inverters. For the moment, I am defeated by this particular kind of technology. So I next took a few steps farther down the technology ladder and wondered about simply rowing my boat. Again, lots of small sailboats are capable of being rowed and one of my favorite boat designers—Phil Bolger—purposefully incorporated rowing capability into some of his most innovative sailboats, including the Birdwatcher. He admitted that few builders were willing to embrace this form of propulsion, but it could be done. As all this was going on in my mind, I continued to work on the motor mount, which seemed prudent because, in the end, I might want an outboard. Even contrarians need to make compromises and concede defeat from time to time. For now, I am filled with theories and philosophical convictions. But the wind and waves may have other opinions and, in the end, I’ll defer to their judgment. 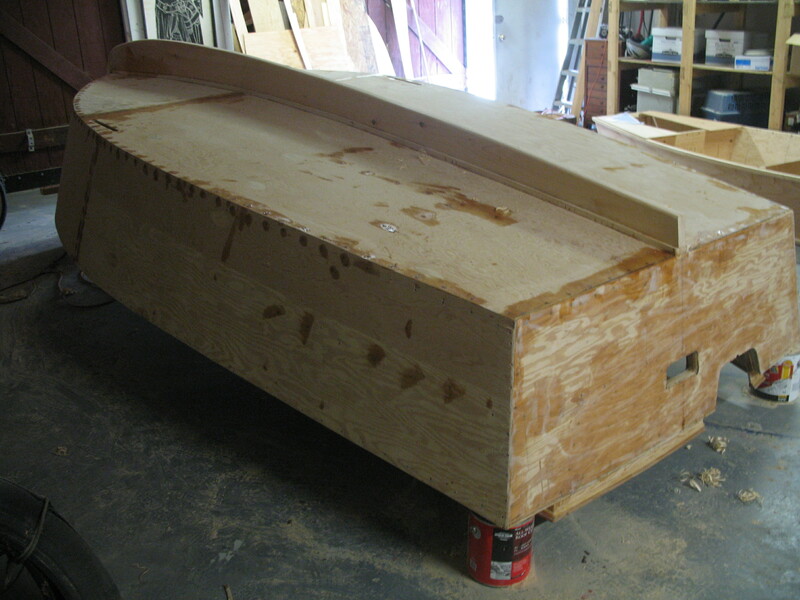 I don’t generally reveal to strangers that I am building a boat. It seems a bit eccentric to talk about rudders and coamings when everyone around me is thinking about gutter spouts, leaky faucets, and weedy lawns. I worry that I might look like the alien in District 9, explaining how I’m going to return to the mother ship in my homemade craft. This was the dream. It's taking me a long time to get there, but I'm finally on my way. But, as I say, he caught me off guard, so with only a small hesitation in my voice I told him that I was building a sailboat. Instead of recoiling in fear, he smiled broadly and got a wistful look. “Really? he said with genuine interest. “I’d like to build a boat but…” And here he inserted a couple of predictable reasons why such a thing would be impossible. The conversation ended abruptly when a lady walked up wanting his advice on wood filler. But I ambled away thinking about how I’m not so crazy after all. 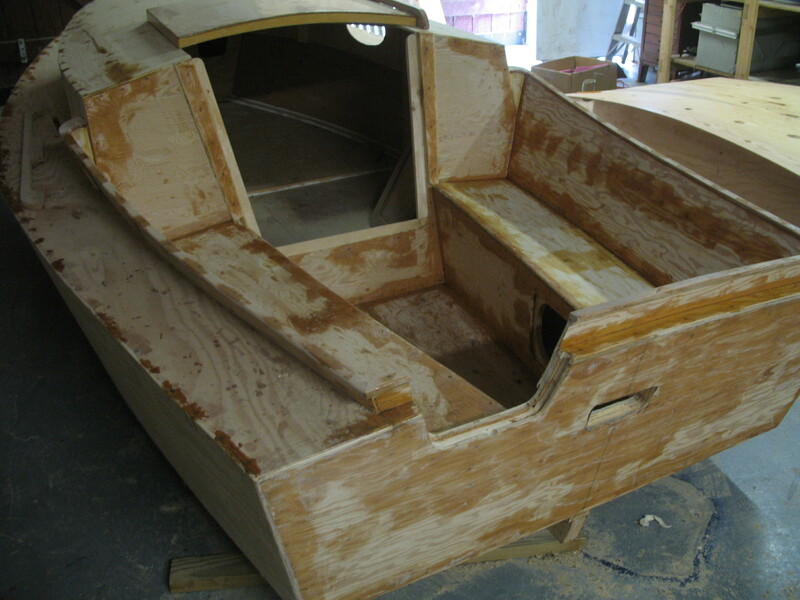 The only thing that separates me from millions of other people is that I am actually building my boat. I’m doing something that many people (well, guys, mostly) want to do—but don’t ever do. I don’t feel particularly brave or adventurous. I chide myself for not being a risk taker and my wife tells me that I dress too conservatively. But for some reason, I broke through the usual barriers (internal and external) that blocked me for thirty years from starting this particular project. And now, at last, I’m having a blast. I may complain in this blog about how long it takes to build a boat and how frustrating it is to solve small problems, but the truth is that I’m having a great time and I don’t regret my decision to undertake the project. It’s time consuming, but not very hard. So why, I wonder, do so many people sit on the sidelines and not follow their own dreams? Why do so many boats exist only in the imaginations of armchair sailors? Why are so many African safaris only completed in front of television sets? Why does a whole life pass without at least trying what, in our hearts, we most want to do? Yes, yes, there are many good and fully legitimate excuses for inaction. Like most people, I’m not rich, I have to work, I have a mortgage, I have kids. But I’m not convinced that these are the real reasons. Forces of inertia, conventionality, and fear might be the largest hurdles, even if they only exist in our minds. It’s hard to go against the current. It takes real bravery to be even slightly different from the people around us. But when we do break away from our day-to-day lives, we often find that the fears are unwarranted and the rewards are real. Like a muscle, bravery grows with practice and gives us the strength to try new things. In some ways, my boat building adventure actually began when my wife and I took our three small children to Mexico for a couple of years. Before leaving, people told us that it was dangerous and that our children would be warped. We went anyway, and found that the naysayers were wrong. The children were happy and we felt completely safe. And once there, we also found fellow expatriates who were living amazingly adventurous lives. Some had been traveling for years—Fiji to New Zealand; Ecuador to Africa. A few also had children (who appeared happy and well adjusted). Suddenly, we were the conventional and boring people because all we did was drive to Mexico and rent a small house. But by entering this particular world of globetrotting expats, our sense of possibility widened further. We talk boldly of completing even bigger and better adventures. The world grew larger, the barriers smaller. One day I fell into conversation with an American retiree who was wintering in Mexico. 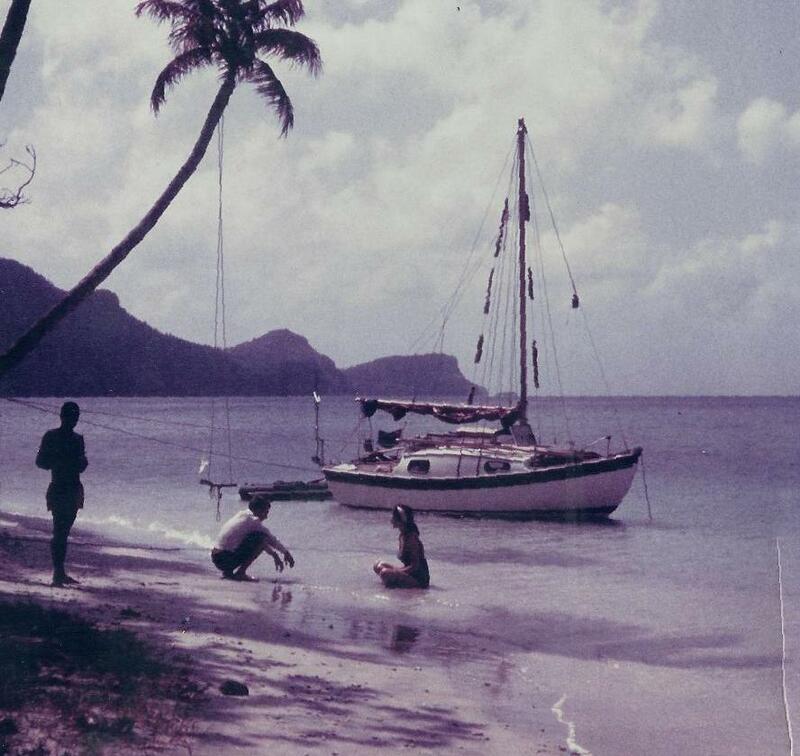 Back home, he had a sailboat, which he sailed around Florida and the Caribbean. I admitted to him my life-long fantasy of building my own boat and undertaking a similar adventure, but explained that this was now impossible because I had three small kids. I expected the man to give me a nod of agreement, but instead of commiserating, he starting telling me all about the liveaboard kids he saw in Caribbean ports, and painted pictures of children swinging happily from the rigging and playing games along the shore. Then he started telling me about the kind of boat I should get. This had never happened before. Back in the States, people either stared blankly when I talked about my dreams or readily agreed that it wasn’t a realistic plan. Here, in the mountains of Mexico, I found a guy who treated my dream as both reasonable and doable. Finally, I saw that the only person keeping me off the water was myself. That very day, I Googled “boat building” and discovered the Glen-L catalog and several other popular boating Web sites. We returned home a year later and it took a few more years to build up the commitment and courage to buy my plans for the Pocket Cruiser, which I discuss in some of my earliest postings. This boat isn’t big enough for a family cruise to the Caribbean, but, for now, I don’t mind. It’s enough to start with a tiny act of rebellion. Step by step, I gain courage, find people who will support my ideas, and learn the necessary skills. This takes me to my next challenge, and then the next. This is one thing I have learned about life: Small acts of bravery lead to larger acts of bravery. If I can build a boat, what else can I do? Maybe I really can sail it down the Chesapeake. Maybe I can go the Bahamas. Maybe I don’t need a house in suburbia. Maybe—who knows?—I can live a very different life. By taking a small sideways step and trying something new, we enter whole new worlds. Incrementally, we can become the people we want to be. We all have our challenges and our own rebellions. Maybe, for you, boat building is not brave or rebellious. But in my world, it is. I grew up in a family that prized intellectual achievement. The talents of artists and craftsmen, while praised, were not part of my family’s DNA. So I stayed on the established path and even entered my father’s line of work (education policy). For many years, I thought it was my calling because I was successful. I methodically accumulated all the trapping of middle class respectability. Yet I never felt the kind of passion my father had for his work, nor did I feel at ease in my suburban life. My father believed he was changing the world; I didn’t. My father liked to come home from a long day in the office and mow the lawn; I hate mowing the lawn. So why did I work in education? Why did I have a lawn? It finally dawned on me that I was unhappy because I was trying to live my father’s life, not my own. I did not have this revelation until after my father’s death. Only in hindsight could I see how completely (in a fully loving and well intentioned way) he had orchestrated my life, and how easily I had followed along, assuming I would have his passion and his zest for life simply by doing what he did. In the mid 1980s, Robin Williams starred in a popular movie called The Dead Poets Society. In the movie Williams, who plays an unconventional yet inspiring teacher (the only kind of teacher ever portrayed in Hollywood movies), admonishes his students with the phrase, “Carpe diem!”—Seize the day! My father loved this phrase. It expressed his belief in taking action, a commitment to making a difference in the world. “Carpe diem!” He was ejaculate at the dinner table when talking about a plan to make schools better. In contrast, I found the phrase confusing and somewhat irritating. “What does it mean to ‘seize the day?’” I asked my father. Does it mean that I should work twice as hard at my job?—That I should stay in the office till dark and not come home until the kids are in bed? Or does it mean that I call in sick and take the kids to the park because it’s more important to smell the roses? Or does it mean that I quit my job, abandon the family, travel to India and work with Mother Theresa? It’s an empty, pointless exhortation, I said, when you don’t know what you want, or want more than one thing. My father thought this was a novel idea. He never felt uncertain or conflicted. I tell this story because I feel, at last—at the age of 45–that I am seizing the day. I don’t yet know where it will all end since ultimate goal of my life is not to build this little boat or even to spend a week on the Chesapeake. But I feel I am heading in the right direction because I feel whole and happy when I work on the boat and when I think about the opportunities it will create in the future. From these small steps, I am gaining the skills and, even more importantly, the courage to finally be the person I want to be. I am hoping to one day say “carpe diem” and know what it means. 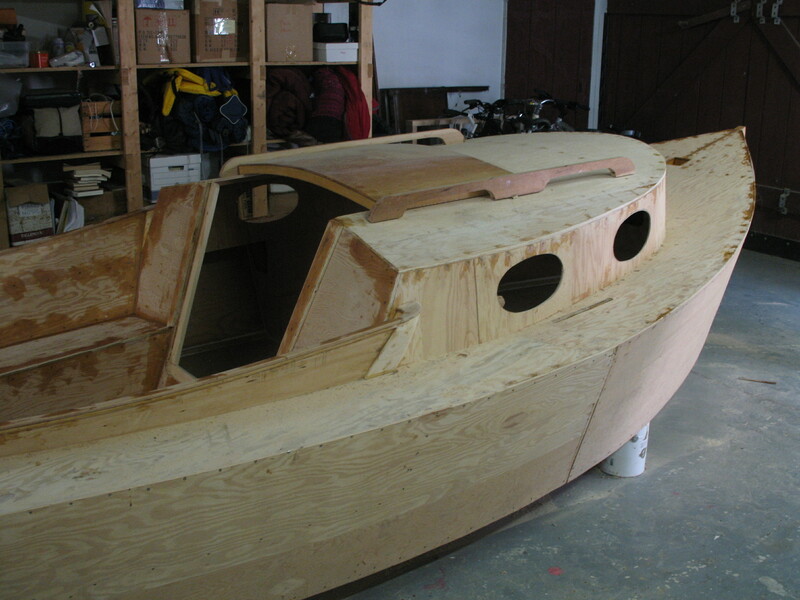 You are currently browsing the Build a Boat, Sail Away blog archives for June, 2010.